Due to the severity of these illnesses, it is crucial that anyone with an eating disorder seeks treatment as soon as possible. Early intervention and professional treatment are key factors in ensuring ongoing recovery, preventing relapse, and, ultimately, saving lives. Anorexia Nervosa: People suffering from anorexia nervosa typically resist caloric intake and may excessively exercise, causing them to lose more weight than is considered normal or healthy for someone of their height and age. People with anorexia believe they are overweight even when they are demonstrably underweight. Symptoms of anorexia nervosa include carefully controlling portions; frequently weighing yourself; excessive dieting and exercise; extremely low body weight; distorted body image; and extreme fear of gaining weight. Bulimia: Bulimia is when someone binge-eats and then takes laxatives, exercises excessively, engages in fasting, or forces themselves to vomit later as a means of avoiding weight gain. People suffering from bulimia often feel a loss of control over their binge eating episodes. Because people with bulimia tend to maintain a normal healthy weight or are only slightly overweight, it may be more difficult for friends or family to recognize that their loved one is suffering from the disorder. Symptoms that people may notice include regularly using the bathroom after meals; large amounts of foods disappearing quickly; empty packages of laxatives in the trash; compulsive exercise; and dental problems from frequent purging. Binge Eating Disorder (BED): Binge Eating Disorder is similar to bulimia, except that a person suffering from BED doesn’t purge, take laxatives, or otherwise engage in compensatory behaviors after a binge. As a result, these people are usually overweight or obese and may suffer from related health problems such as high blood pressure, diabetes, and cardiovascular disease. People who binge-eat may consume anywhere from 5,000 to 15,000 calories in one sitting. Binge eaters typically experience feelings of loss of control surrounding their eating habits and may experience shame, guilt, or other negative emotions. For this reason, they may seek to hide binge-eating episodes from loved ones or hesitate to seek help. Residential treatment centers will not admit a person who hasn’t first been cleared by a doctor as medically stable. Similarly, because self-harm (cutting or burning) and suicidal ideation are commonly present among those with eating disorders, treatment facilities may also require psychological clearance to confirm that people are no longer a danger to themselves before they can be admitted into a program. Once acute emergencies have been taken care of, a person may then be placed in an inpatient facility for further treatment. Inpatient treatment is typically the first line of treatment for most people suffering from eating disorders. Due to the severity of such illnesses, 24-hour supervision is required to promote recovery, improve physical health, and prevent relapse. A residential center provides a person with a refuge from the outside world, free from the triggers and stressors one may encounter in daily life. Treatment personnel provide meal assistance, as well as monitor for self-harm and disordered eating behaviors such as purging and taking laxatives. Inpatient treatment for eating disorders is similar in many ways to residential rehabilitation programs for those suffering from substance abuse, with treatment ranging from 30 to 90 days in duration, and in more severe cases lasting as long as 6 months to a year. Treatment may take place in a hospital setting or in a residential center like a large home. Medication administration (i.e. antidepressants, anti-anxiety). Alternative and complementary treatments (acupuncture, massage, yoga). Cognitive Behavioral Therapy (CBT): Cognitive behavioral therapy is the most commonly used evidence-based form of therapy for adults with eating disorders. CBT helps you recognize the connection between your thoughts, feelings, and behaviors. When used for eating disorders, you begin in the behavioral phase, focusing on stabilizing eating behaviors and developing coping skills for dealing with stressors and triggers. As therapy progresses, you enter the cognitive phase, where you learn how to restructure your thoughts and change negative core beliefs and self-image. Dialectical Behavioral Therapy (DBT): Dialectical behavioral therapy is primarily used with people suffering from Borderline Personality Disorder, but it has also shown effectiveness for people with eating disorders. DBT works by teaching people how to better regulate emotions, tolerate distress, and practice mindfulness. Interpersonal Psychotherapy: Interpersonal psychotherapy may also be used in eating disorder treatment. This form of therapy works to resolve interpersonal and relationship issues that typically occur in the context of eating disorders. It helps people to better identify and express their emotions as well as recognize the ways in which their past experiences have an impact on their present-day behaviors and interpersonal relationships. Equine Therapy: Equine therapy has proven effective at reducing symptoms of many mental and behavioral health disorders. It is a form of psychotherapy that involves interacting with horses to assist in personal growth. The bond between humans and animals can help foster emotional healing and feelings of empowerment and can help a person struggling with an eating disorder to improve their self-image and self-esteem, as well as provide a sense of unconditional acceptance. Once a certain amount of progress has been made, a person will graduate from inpatient treatment and transition into an outpatient program.For those with severe cases of eating disorders, outpatient treatment is typically sought out as a step down from residential treatment programs.5 Once a certain amount of progress has been made, a person will graduate from inpatient treatment and transition into an outpatient program. For less severe cases of eating disorders, people may begin with outpatient treatment as an alternative to inpatient treatment. The Maudsley Approach is a leading intensive outpatient program model for treating adolescents with anorexia nervosa. Research has demonstrated the long-term efficacy of this approach, with 75% to 90% of the adolescents studied showing full weight recovery at a 5-year follow-up. The Maudsley Approach was conceived as an alternative to hospitalization by adolescent psychologists and psychiatrists at Maudsley hospital in London and is a family-based treatment in which parents play an active role in the youth’s recovery. It is important to remember that relapse is often a part of the recovery process. It can be incredibly difficult to maintain recovery outside of the treatment environment, surrounded by added stressors and triggers. Relapsing back into old eating habits and behaviors does not mean a person has failed their treatment, though. Full recovery is still possible even after relapse. Individual counseling: Continuing counseling at regular intervals following initial treatment can help you maintain sobriety by fostering self-awareness and emotional regulation, developing coping skills for dealing with stress, and maintaining healthy body image and eating habits. Family therapy: Family therapy is often an important component of aftercare treatment, particularly for adolescents who need the support of their parents in maintaining recovery. Family therapy can help improve family communication patterns as well as help parents learn how to support their children in developing healthy eating behaviors and adolescent identity. 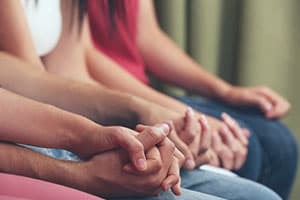 12-step programs or other peer-support groups: 12-step programs and other peer-support groups can be incredibly beneficial to a person in eating disorder recovery. Peer-support, as well as the regular routine of meetings, can help provide you with additional inspiration and structure to support their recovery. Most 12-step programs provide a great opportunity to eventually select sponsor who is also in recovery who you can call if you feel you’re in danger of relapse. National Eating Disorders Association. General Statistics. National Association of Anorexia Nervosa and Associated Disorders. Eating Disorder Statistics. U.S. Department of Health and Human Services. Eating Disorders. National Institute on Mental Health. (2014). Eating Disorders: About More than Food. National Eating Disorders Association. Treatment Settings and Levels of Care. Eating Disorder Hope. Equine Therapy. Le Grange, D. & Lock, J. Family-based Treatment of Adolescent Anorexia Nervosa: The Maudsley Approach. Maudsley Parents. Ekem, J. & Howard, C. (2016). Recurrence of Anorexia: Likelihood, Statistics, and Suggested Treatment Approach. Eating Disorder Hope.